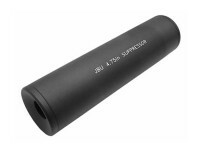 TSD JBU Fake Airsoft Suppressor, 4.75", Aluminum. 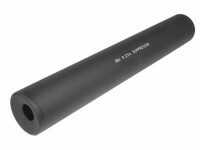 Barrel extensions & suppressors. This fake suppressor by JBU fits the outer barrel on most airsoft guns with a 14mm counterclockwise thread. 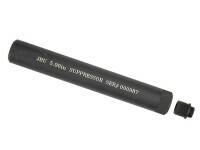 The fake suppressor is for looks only and will not actually decrease the sound of your airsoft gun. 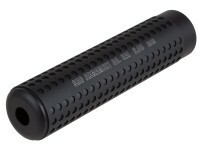 The fake suppressor features JBU laser markings and has a lightweight matte finish. For airsoft use only. Things I liked: This item is simple and adds only the value of "looks" to the gun it is added to. I put it on my Crosman DPMS SBR because I didn't like the way the original muzzle looked. Now the rifle looks complete. Things I would have changed: Nothing to change with the product. What I wished would have happened is for Pyramid Air to have shipped this according to what I paid and according to their policy on fulfilling orders. I paid for 2 day shipping, but this was shipped late using standard 5-7 day shipping. I sent in my order after 12pm on a Tuesday, and my order wasn't fulfilled for 2 days despite their policy being "the next business day". So, I paid extra to receive this item quicker and then received it over a week later due to 2 errors by Pyramid Air. What others should know: When installing this item, I had a hard time at first due to the threading on the barrel of the DPMS SBR being covered with a light coating of paint. Once the coating wore off the first few threads from me slightly forcing the pairing, this item spun on really quick and held tight. Things I liked: The aluminum construction is sturdy and durable. The matte black finish is non-glossy, non-reflective. Things I would have changed: The use of a left-handed thread in the connector opening is totally asinine and stupid. 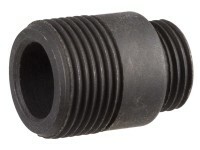 The threaded adapters for my pistols have a right-handed thread in the barrel that follows the principle of "righty-tighty, lefty-loosy". 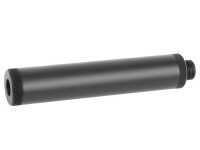 The left-handed thread in the suppressor makes it a "lefty-tighty, righty-loosy" attachment. Consequently it's impossible to fully tighten this suppressor on the pistol barrel because the two threads work against each other. 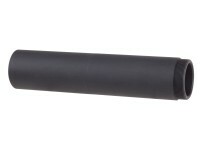 This suppressor needs to be redesigned with its own permanently attached right-handed thread adaptor. 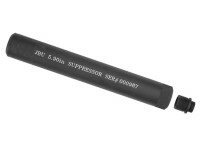 What others should know: Although this fake suppressor was originally made for airsoft pistols, it can also be used on the Swiss Arms SA1911 TRS (both black and silver versions) and the Swiss Arms SA 92 0.177 steel BB pistols. 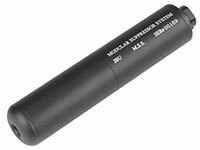 This suppressor will not work on the Cybergun silver version Sig Sauer P226 X-Five because it interferes with the movement of the blowback slide. Things I liked: Solid metal nice markings. What others should know: It came with my Swiss Arms 1911 combo and adds about 5fps on average as tested with my chrony. Will it fit on the sig sauer p226? If you have the airsoft version threaded the 14mm counter clockwise, then yes it will fit.